Last Spring, we brought in the best lithium-ion lawn mowers at the time and had a field day testing them. Like then, we’ve let Tim Johnson’s yard grow up a bit to give our participants plenty of opportunities to show us their strengths. There’s a big difference in cutting a 20″ swath with a metal blade and trimming with a dual line string at 15″. Where the mower has a cutting edge that runs over a large part of the steel blade, it’s only the string tip that does the cutting for a string trimmer. While it doesn’t cut the same volume as a mower, the string trimmer can take advantage of its design to maximize battery efficiency. This begs the question – just how do you choose the best battery powered string trimmer? We brought in 11 of the most popular models to take a look at their features, performance, and commercial Pro potential. A lot of what you need to know about string trimmers can be found in the specifications. Features like battery capacity, attachment capability, and cutting swath set them apart from each other. There’s also the issue of the trimmer line. How efficiently the line cuts makes a huge difference in performance. We brought in our professional lawn maintenance guru, Tom Rutherford, to help us make an honest comparison from a Pro’s perspective. A typical 1/4 acre home probably doesn’t need much more than 15 or 20 minutes of run time to effectively get through all the trimming duties. A Pro lawn crew has to do that 15 times a day or more. They’re going to need enough battery capacity to run for several hours. Swapping a couple of batteries on a charger with an inverter is doable – keeping 10 batteries on board to get through the day isn’t. DeWalt and EGO have available 7.5 amp hour batteries, but Stihl (24.75) and Husqvarna (26.1) have backpack batteries that leave everyone else in the dust. When you’re looking at having a system of OPE tools on the same platform, the backpack capacities begin to look very attractive. Cutting swath is another factor. Trimmers in the 13-inch range tend to be more efficient and can get away with using less torque to keep the speed up. 15-inch models are where a trimmer needs to be if it has any hope of getting a Pro’s attention. From time to time, you’ll see professionals pull the guard off completely. We don’t recommend it as it has a cutter to keep the line from exceeding the maximum line length. Eight of our models get to the 15″ mark with several moving beyond. Husqvarna stops at 15.75 inches while Echo, Greenworks, and Kobalt each stretch to 16 inches. Most of our trimmers come in using 0.080-inch trimmer line. Pros need at least 0.095-inch and preferably 0.105-inch or better. The thicker line doesn’t break as easily so you spend more time trimming and less time changing in addition to the cutting power of thicker line. Even though most of these are shipped with the 0.080-inch line, many are capable of 0.095-inch with the stock head. Stihl is the only one that can handle 0.105-inch out of the box. Stihl and Husqvarna are both capable of using trimmer heads with greater capacities as an upgrade though. Husqvarna upgraded their 536LiL specifically to handle their grass and wood cutting blades – something none of the others are rated for. Pro lawn crews typically have dedicated machines for string trimming, edging, and hedge trimming, but homeowners can save a lot of money by using interchangeable heads and tools that cover everything from blowing to brush cutting. When it comes to the Pro models, we’re not as concerned about attachments for the power head. Ryobi’s entire design is built around the Expand-It system of accessories. There are a ton of options available from Ryobi, but it’s a universal connection, so you’re not tied to Ryobi attachments if you see something else you like. Greenworks and Kobalt are also universal attachment ready, though Kobalt recommends that you not use a brushcutter. Echo has an attachment design, but only rates it to use the Echo string trimmer attachment. We can assume that they are at least considering offering Echo branded attachments in the future. When you have to change the line, it can be an easy or frustrating process. Some of the trimmers we tested take advantage of very intuitive and simple changes that can be made on the fly in just a few minutes or less. Others were more traditional. Regardless, you can always upgrade the head if you want to get something easier. Oregon starts shipping their ST-275 with Gator Speedload heads May 1st. These load simply by using a pre-coiled line and changes take less than a minute. Oregon was by far in the lead here, but you are tied to their system if you use it. Echo was the first string trimmer to use the Speed-Feed system that we saw. With this system, you thread a full length of the line (typically 15 – 30 feet, depending on diameter and head) through to the halfway point, then rotate the head opposite its feed direction to load the line. Since you do the entire operation without removing the spool, you’re not fighting with tangles and jumpy line. This process takes about 3 minutes and similar systems are found on Greenworks, Kobalt, and Ryobi. Ego, Husqvarna, and Makita require you to remove the spool but make line installation easier by hooking the mid-point of a single length on and coiling both the top and bottom lines at the same time. DeWalt and Stihl require spool removal and use separate lengths for each line while Worx is a single line system. Run time takes on a new twist with battery powered string trimmers. The professional crew is likely going to go full speed ahead and get done as quickly as they can. Homeowners, however, can take advantage of greater efficiency found in the eco modes of several models. For regular maintenance cutting, eco mode is just as effective as full power and extends the run time greatly. Users willing to take a little more time for cutting will find that even large yards can be trimmed on a single charge. We tried to get 4.0 amp hour batteries for each model, but some don’t have that option. To make it a little fairer, the results show how many minutes of full blast run time each trimmer gets per amp hour of battery capacity. Multiply the time by the number of amp hours in the battery you’re considering to get a pretty solid approximation of what run time you can expect. On the low end were Oregon (7:27 per amp hour) and Makita (7:58) with Stihl (8:50) and Husqvarna (9:03) wrapping up the sub-10:00 group. Greenworks (18:07 per amp hour) was more than two minutes ahead of the closest competition with Ryobi (16:03) in second and Worx (14:08) in third. When it comes to cutting grass, speed combined with thicker trimmer line equals better cutting power. There really weren’t any surprises here with the 0.095-inch capable models having a clear advantage over the 0.080-inch participants. All were able to handle standard lawn maintenance cutting just fine. When we went to hacking at some taller grasses infringing on the yard, we could feel the difference. Husqvarna and Stihl hold a higher standard in cutting power with DeWalt, EGO, Echo, and Makita not too far back. Oregon slipped just a little behind that group to hang out with Greenworks and Kobalt, followed by Ryobi and leaving a wide gap to the single line Worx. Greenworks and Kobalt both feel like they have the power to run 0.095-inch line, but neither are recommended to use it. Since we only tested within the design intent, we had to see what we could get out of the 0.080-inch line with them. You could probably get away with 0.095-inch on Makita’s trimmer as well, but with recommendations stopping at 0.090-inch we were stuck in the same place. You’d think that all things being equal (namely trimmer line), the faster spinning trimmer would give you the ability to cut the fastest. That’s true to an extent. 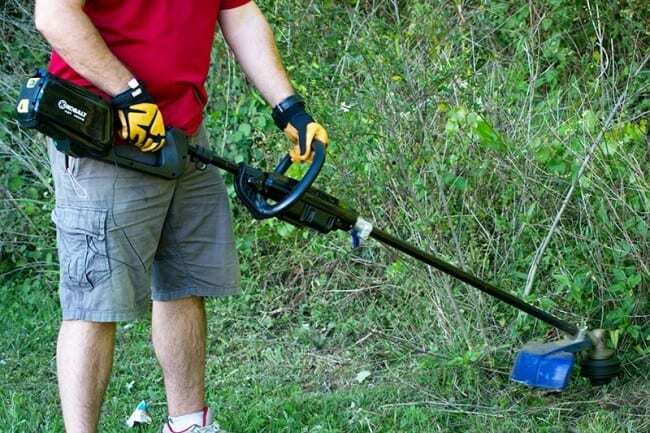 There’s still a wide gap between lithium-ion powered string trimmers and gas trimmers though. For example, the top rated dual-line string trimmer we tested was DeWalt’s DCST990 at 6600 RPM with Makita right behind it at 6500 RPM. Yet when you compare that to Echo’s 28.1 cc SRM-280T spinning the same line at 10,700 RPM, you have to wonder if lithium-ion can really be Pro rated. Our answer is a resounding yes. None of us that use gas string trimmers ever work at wide open throttle with string. Edgers and brush cutters? Those get the nod for full power. We agreed that a switch to blade cutting would be required if we needed to hack a lot of overgrown grasses. So given how we use a string trimming head, we’d say the battery powered options are pretty well dialed in for the job. One of the benefits of lithium-ion string trimmers (and li-ion OPE tools in general) is the ability to work with less noise. We measured each trimmer in both dB(a) and dB(c) weighted ranges. The difference is dB(a) ratings (most common) measure the actual sound pressure level produced. The dB(c) weighting accounts for how the human ear interprets sound so it gives you a more accurate picture of how loud each one sounds to us regardless of the actual energy produced. To get an accurate picture of sound level, we measured from the ear closest to the trimmer to the point where the sound reached the highest level out in our field away from building and objects that might reflect the sound waves. We also did this test with using the same line on each model aside from Oregon, which had the proprietary Gator SpeedLoad system, but with the same line diameter. You’ll notice that the trimmers with an eco mode have a major benefit in the sound department. At full throttle, Ego (84), Makita (85), and Oregon/Worx (87) round out the top three spots on the dB(a) scale. For those with an eco mode, Makita (81), Greenworks (84), and DeWalt (85) were the quietest. There were a couple of oddities in our results that we used the dB(c) weighting to prove. First Husqvarna didn’t sound as loud to us as the meter was reading [96 full, 92 eco dB(a)]. The dB(c) (92 full, 87 eco) weighting confirmed that it sounded quieter than the pressure level indicated. Also confirmed in this scale, Greenworks sounded louder it to us in eco mode than in high speed [82 full, 84 eco dB(c)] although it read 88 and 84 dB(a) on the regular scale. To make the most sense of this, go with the dB(a) scale – it’s what OSHA cares the most about and is a measure of the actual pressure level reaching your ears regardless of how it is processed. Balance really wasn’t an issue for most of the trimmers we tested. Many trade off having the battery on the top of the tool by placing the motor at the trimmer head. Where a few models change tactics is by being attachment ready, forcing the motor to be above the shaft link, but reducing the resistance that comes from longer wires between the battery and motor. The choice is to either add weight to the head to balance it out or deal with a slightly off balance unit. Ryobi & Kobalt dealt with this by shifting the motor to the middle near the controls and ended up with decent balance. Echo and Greenworks suffered the consequences of having the battery and motor together at the top. Greenworks’ new 4.0 amp hour battery is longer and is forced to enter from the side of the unit. It’s not only the heaviest, the majority of the weight is on the top and the battery pulls the balance left in an effort to succumb to gravity. We didn’t have vibration on our initial list of tests to run since the lack of a gas engine eliminates much of it in the first place. It didn’t take long to discover that some units were better than others. 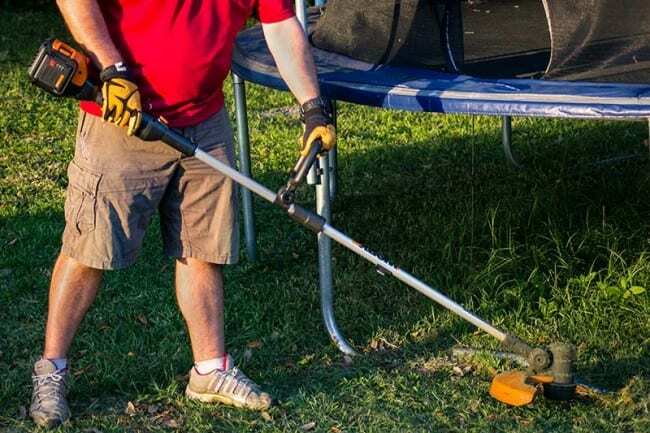 Ego’s 15-inch string trimmer is astounding in how little vibration it produces. It’s a difference that you really have to feel side by side with other trimmers to appreciate. Husqvarna, Makita, Oregon, and Stihl also get high marks for low vibration. Greenworks was in the middle of the pack with DeWalt and Worx producing a bit more. Echo, Kobalt, and Ryobi had the most vibration felt. Of course, it wouldn’t be our annual OPE shootout without the Sun ‘N Fun Fly-In taking place all around us. Last year, we were kept company by the US Air Force Thunderbirds. This year, they provided a couple of F-22 Raptors for our enjoyment. Kobalt partnered with Greenworks at the top of the voltage charts. The Kobalt 80V string trimmer lacks higher battery capacities, but the 2.0 amp hour option that comes with it should be plenty to trim most lawns, especially in eco mode. Greenworks added a 4.0 amp hour battery not long ago, so keep your eyes open for Kobalt to find one in production soon. Attachments are accepted on this model, though the manual notes you shouldn’t use a brushcutter with it. Despite the 80V power, Kobalt is only rated for 0.080″ line. It has an excellent line change system similar to the Speed-Feed model and top cutting diameter at 16″. It’s in the 10+ pound group but isn’t as heavy as the Greenworks 80V. This is a homeowner level line that balances decent power with budget pricing. Worx enters the fray with a compelling design for homeowners that makes edging a bit easier than other Li-Ion string trimmers on the market. Their 56V String Trimmer is perfect for homeowners that have a lot of landscaping features to edge around and want a 2 in 1 option. By flipping the trimmer shaft, you can keep the tool balanced naturally and edge easily with a guiding wheel. Worx takes the top spot in keeping the weight to a minimum. It also does a reasonable job with run time, noise level, and ergonomics. Small battery capacity, low power, and a single line trimmer head will be holding Worx back from getting greater consideration for many users. Ryobi’s 40V String Trimmer comes in as one of the few models that are attachment ready. As is their reputation, Ryobi focuses on the needs of the homeowner that wants to maximize their money by offering attachments rather than separate tools. The Ryobi Expand-It system includes a variety of available attachments including an edger, pole saw, hedge trimmer, cultivator, brush cutter, and blower as well as most brands’ optional attachments. Ryobi did very well in our run time test despite the lack of a brushless motor. Line changes follow the Speed-Feed style and are very fast. The cutting swath is a solid 15″ and they kept the weight under reasonable control as well. It’s notably weak in the noise and vibration departments. Ryobi owns their niche as a DIY brand without feeling cheap or lacking in features. This should be a very compelling platform for any homeowner thanks to a complete system including a mower. Echo is a Pro feel trimmer but lacks the battery capacity for a lawn crew to finish the day without carrying multiple batteries. Sharing the top spot for the widest cutting swath is a plus along with the ability to use 0.080-inch or 0.095-inch line. Where Echo really shines is with solid power and using the Speed-Feed line change system. Echo currently suffers from vibration and weight issues, so Pro-minded homeowners are going to be the real beneficiaries of this line. The DeWalt 40V Max String Trimmer comes in as part of a solid first generation lithium-ion OPE from the popular brand. They did a great job of creating a line that has the feel of professional level and offering battery options to raise the Pro’s eyebrows. Kitted with either a 4.0 or 6.0 amp hour battery, DeWalt is starting to get some attention from commercial crews. We’d like to see the weight and vibration come down more as they work to make the commercial team. Two-speed modes and 0.080-inch or 0.095-inch line capability make this an excellent option for the prosumer. Oregon’s ST-275 string trimmer has been around for a couple of years now. In May, the company plans to start shipping the trimmer with their Gator SpeedLoad upgrade as the stock head. While the upgrade is welcome by many homeowners that want to keep line changes as fast and easy as possible, our resident lawn maintenance guru isn’t convinced that he’d want to be married to the system. Despite that, it earns the number one spot for line changes. Even with a 4.0 amp hour battery, Oregon kept the weight down really well. 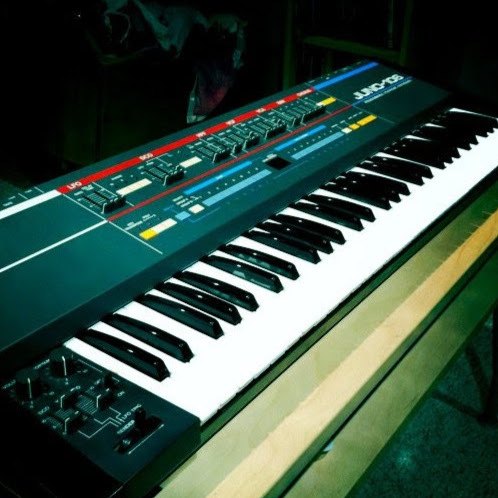 Ergonomics are solid with power and noise level coming in the middle of the group. This is a lineup with a professional feel but is going to be better suited for the Pro-minded homeowner thanks to its small cutting swath and lowest run time per amp hour. Greenworks doubled the 40V class to 80V, but that kind of power isn’t really necessary for your string trimming duties. Where the additional power comes in handy is with the attachments you can grab to deal with heavier growth and brush. Despite attachment readiness and a 16″ cutting swath, it’s still only rated for 0.080-inch line. Greenworks absolutely killed it in our run time test, forcing me to trim continuously for nearly an hour and a quarter. Line changes are a major plus for this model and the 16-inch cutting swath ties for best in the group. They also kept the noise level under 90 dB(a) for pretty well-rounded performance. The performance is offset with the highest weight we’ve seen in a string trimmer and balance that was knocked off kilter with the 4.0 amp hour battery. We’re thankful for the shoulder strap, though we’d recommend you stick with the 2.0 amp hour battery in this model. Combined with a maximum battery capacity of 4.0 amp hours, Pro lawn crews will likely want to pass on this one while homeowners of larger lawns should give it some serious thought. Stihl is brand hyper-focused on the professional lawn maintenance user. They have an optional 24.75 amp hour battery backpack that makes switching between tools easy. The variable speed trigger is paired with a speed dial that includes dozens of micro settings to help dial in the combination of power and efficiency you need. While the FSA 90 R isn’t blade compatible like Husqvarna’s 536LiLX, it can handle several Stihl Commercial Trimmer Heads, getting the line diameter up to 0.130″. One unique feature is found on Stihl’s trimmer head. A new fan wheel was engineered specifically to direct air back to the brushless motor, allowing it to run cooler and extend the life of the tool. Power, available battery capacity, and ergonomics highlight Stihl’s resume’. An upgrade in the line change system used on Stihl’s stock head will bump it up a few points along with further noise reduction (thought it’s nowhere near gas trimmers). Despite an overall 4th place finish, there’s no doubt that Stihl has a professional level string trimmer with the FSA 90 R.
Makita comes in as the battery oddity in the list – not because of voltage, but because they use 18V batteries in a series to get 36V power. Since they use the same exact batteries as Makita cordless tools, there’s no new platform to buy into for current users. Like Husqvarna, Makita offers a rotation change to switch the direction the trimmer head spins and keep debris discharging where it’s more convenient. Makita did well keeping the weight and noise level down while delivering excellent power and ergonomics. With smaller cutting swath, limited run time, and line capacity under 0.095″, this is geared more toward the homeowner. It’s going to be a complete line with blower and hedge trimmer already in place. We saw the mower for the first time at World of Concrete, so keep your eyes open for it to show up. Husqvarna clearly went after the professional lawn crew with their Battery Series of products. When Clint attended the Silent City event in Belgium, our eyes were really opened to how serious the company is taking noise restrictions while still meeting the needs of the pro. With a 26.1 amp hour battery backpack available, you won’t find better battery capacity anywhere. Additionally, the backpack design means you can swap from the Husqvarna 536LiLXP to any of the other battery powered tools without taking it off. Simply unlock the adapter from the battery compartment and lock it into the next tool on your list. One of our biggest complaints about string trimmers in general is the way they throw debris on us if we’re trimming in the “wrong” direction. Husqvarna deals with this by offering two-way head rotation. You can change directions with the press of a button on the control panel like Makita. The upgraded 536LiLX is identical to the 536LiL Clint reviewed – it’s just now capable of using Husqvarna’s grass and brush cutting blades. Husqvarna excels in the weight department, coming in under 10 pounds with the 4.2 amp hour battery. It offers top tier power and cutting swath along with excellent ergonomics. The cost of entry into the system is pretty steep, but this is one of only two platforms we feel are ready for the professional crew today. Admittedly, EGO’s first effort for a battery powered string trimmer left us feeling like it was lacking. They turned it around with their second generation and have a legit contender that topped out over all others after adding up the scores. The line went up to a standard 0.095-inch and the cutting swath made it out to 15 inches. Kits include 2.0 and 2.5 amp hour battery options, but a bare 7.5 amp hour battery is also available if you have a ton of yard to cut. How did the $179 Ego beat out Pro models that cost hundreds of dollars more? They kept the weight, noise, and vibration down while still offering excellent power with a 15-inch cutting swath. Even though the line really isn’t designed to attract the commercial pro, it’s our top all-around performer and clearly the best value in the group. Great review guys. Lots of time and effort went into this one. Give away after the test? GREENWORKS OFFERS A 15 amp hour 80 volt back battery on their website. So how much experience do you have mowing lawns and using a string trimmer Kenny? Are you a pro? what is your experience level with these tools? You seem like a newb…….. This is the best trimmer I rigged up a black and decker trimmer to run off Milwaukee m18 red lithium batterys! You would come out with this two weeks after I made my choice/purchase! It may be on the lower end of your list, but after two uses I’m still happy with my Ryobi 40-volt trimmer! I run a small property maintenance company that does all facets of home maintenance, including landscape maintenance. None of these units have the power to do the job properly and none of them hold a charge long enough to complete the needed maintenance on a typical suburban property. In my opinion, the best value for a home owner is the Stihl KM55. It has multiple attachments, is reasonably priced, is powerful enough to get the job done and is Stihl quality. I have the Ryobi 40v trimmer and it works great. I was considering Ego but couldn’t go with them because I need a trimmer that is attachment capable. Of all the trimmers on this list Ryobi seems to be one of the only ones that is attachment capable and is not very expensive. I’m beyond thrilled with my Makita XRU07Z that I special order from Ohio Power Tool! The ingenuity of the two speed electronic transmission is one of the highlights. I will be though, visiting Ohio Power Tool soon, to purchase additional 5 Amp Batteries because I’ve used this Trimmer so much, I need some spare fuel. Note that amp-hours are not directly comparable, because the tools work with different voltages. To get the energy capacity of a battery in watt-hours, multiply the amp-hours by the voltage. For example, this means that although DeWalt and Ego both have 7.5 amp-hour packs, the DeWalt (at 40 volts) has 300 watt-hours of energy, while the 56 volt Ego has significantly more at 420 watt-hours. As another example, the 4 amp hour GreenWorks pack at 80v actually has more energy on board (320wh) than the DeWalt. Not surprised EGO is killing it with there latest trimmer. Overall, they offer the best performing blower at their price point, and their mowers are top notch. Frankly, now that they’re releasing a snow blower this fall (and according to the teaser video footage they posted last week), EGO seems to be the best brand to go with for OPE needs, IMHO. Great review. What would you recommend for the consumer that would be able to cut through blackberries (with a blade attachment if necessary)? The echo seems like a decent choice, there are blade attachments online, and seems like there is adequate power. Any other recommendations? I just spent a considerable amount of time trying to verify if the Ryobi model#40220 which you tested has a brushless motor. Two tects at Ryobi sat it is a brushless motor. The power head part #40002. I’m still not convinced .I bought this trimmer and I don’t want to use it if its not brushless. This article has been extremely helpful — thanks. Since you showed the Husqvarna 536LiLX as not attachment ready, I called the company to confirm the unit can be used with grass and wood cutting blades. For anyone who wants a tool that will do heavy brush cutting as well as regular string trimming, it looks like the 536LiLX should be considered just as versatile as the “attachment ready” competitors. Or am I missing something — your input would be appreciated. What about Greenwork’s other 80v trimmer, the no attachment model? I have both and much more enjoy the bottom motor as it’s quieter, much lighter, more efficient (did you feel how hot that gearbox gets on the top motor model? And it spins faster. I use it professionally and only complaint is the ergonomics when tilting the head for edging. Great information. Unless I missed it something I would be interested in would be how long does it take to charge the batteries. This was a GREAT review. I’m in the landscape industry managing some maintenance crews and am interested to see how these battery powered tools compare to gas models. I have some of the Milwaukee M18 OPE on pre-order and hoping to have it in my hands in another month. I’m anxious to see how it compares to gas (and these other battery options). A big item missing from the comparison is which direction the trimmer head spins. Most professional trimmers spin counter clockwise. Last year I tried the Eco which spins clockwise and it was tough to use. Kenny: May be age of the articles, but seems to be a difference in the Kobalt reviews. Here you say the motor is at the top with the battery, but the Kobalt photo you show clearly shows the motor mid-shaft. Also your individual review of the Kobalt 80 volt (as covered in this article), describes the Kobalt 80 volt as a significant improvement over the previous 40 volt model because of the change in motor position to mid-shaft. Is there a new Kobalt 80 volt out in the last 8 months….what’s going on?? I should have noted, your Kobalt comment on the motor being at the top was in the “Balance” section of the article. Has anyone compared the EGO vs the new Milwaulkee?